Have you ever noticed how economists, politicians, and business leaders consistently fail to foresee major turning points in history? With all of today’s science and technology, why are we still unable to anticipate wars, economic depressions, financial bubbles and even fashion trends? Conventional models for forecasting economic and social trends simply do not work because they rely on a fatally flawed assumption about how people behave. Unfortunately, “fatal assumptions” are common throughout scientific history, and they often languish for far too long. New ideas can blossom only after wrong assumptions are discarded. When evidence refutes long-held assumptions, truth has a chance. A new theory emerges, and the old theory’s plethora of special cases and exceptions fade away. A proper perspective enhances our ability to predict and prepare for the future. The fatal flaw that economics and broader social science fields rely upon is external causality, or the notion that major events are the primary influence and shaper of history. This model is just as attractive –and just as mistaken — as the notion of the four elements, the four humors or a geocentric universe. Yet even in the face of contrary evidence, people find it hard to divest themselves of deeply ingrained notions. Now imagine a modern, ground-breaking theory, which could link all human social behavior — cultural, economic, political, and more — into a single, elegant and unifying framework. Well, such a framework is here, and it’s called socionomics. Socionomics succeeds by turning the assumption of external causality on its head, and it instead recognizes internal causality. People in groups share an unconscious collective disposition that is endogenously regulated. This shared social mood steers the actions that groups take and therefore the events that unfold across time to create history. In other words, psychology precedes actions, not vice-versa. 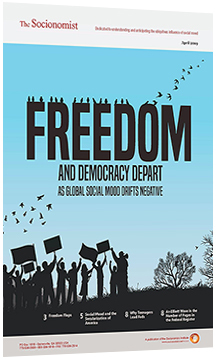 Furthermore, social mood’s fluctuations are patterned, which makes it possible to forecast the type and character of social and economic events. Socionomic causality is the engine of history. The power of socionomics is radical and unprecedented. Conventional social theory would have had you trapped in Germany when the Nazis took over; socionomics tells you when the political environment is likely to turn dangerously unstable. Conventional economics would have you lose everything in a major financial crash; socionomics tells you when and where to expect them. As research marches on, the evidence continues to mount in favor of the socionomic insight. Join the Socionomics Club for free reports, videos and email updates. Or continue with the Learn the Basics series by reading more about socionomic theory.